Update: One of our commenters has pointed out that a current Sprint carrier-switch incentive plan (offering $125 per line to switch from another carrier) ends on June 23rd. Oddly convenient timing, don't you agree? That makes this date seem even more likely. Thanks Todd! 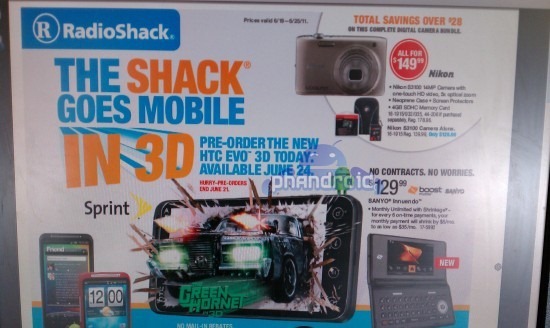 Aside from the almost annoyingly ever-present Green Hornet ad-placement, at the center of the ad you can clearly see the words "Pre-order the new HTC EVO 3D Today. Available June 24." Now, whether the change in HTC's bootloader policy might affect that date is unknown (probably not - unlocking will likely be a post-release OTA sort of thing). But if RadioShack, a 3rd-party retailer, has had a release date given to them, it's probably one Sprint has some confidence in. Guess we'll just have to wait and see. The EVO 3D is Sprint's most anticipated handset to date - sporting a 4.3" qHD glasses-free 3D display, dual core processor, and Sprint's WiMAX 4G. It will be replacing the EVO 4G as Sprint's flagship Android device. It will (supposedly) cost $200 on a new 2-year agreement, or, if you hand in your old EVO 4G or EVO Shift 4G at RadioShack, a paltry $100.